A bond between a mother and child is very important; unfortunately it is not always instant. Where some parents don't have to think about bonding with their child others may only feel a small connection if one at all. Baby massage provides a way to build a bond or make an existing one stronger. There are many benefits of baby massage, it can bring relief from many conditions babies suffer with from birth and beyond, such as colic, constipation, trapped wind, teething, colds and congestion and muscle fatigue. Massage helps to improve a baby's development by stimulating their immature nervous system, and also helps to relax both mother and baby, my son has had a massage almost every day since he was born and is one chilled out little man! 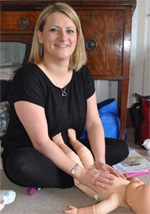 A 5 week massage course with certificate presentation at the end. Learn fantastic soothing techniques you can take away to relax and soothe your baby anytime, anywhere. So, if this sounds like it might be up your street and you would like to meet some other like-minded mums, whilst learning a new skill and spending quality time with your little one, then enquire today and we'll find you your nearest group.